Not only does leaf shape vary between Passiflora species, but between sequential nodes of the vine. The profound changes in leaf shape within Passiflora vines reflect the temporal development of the shoot apical meristem from which leaves are derived and patterned, a phenomenon known as heteroblasty. We perform a morphometric analysis of more than 3,300 leaves from 40 different Passiflora species using two different methods: homologous landmarks and Elliptical Fourier Descriptors (EFDs). Changes in leaf shape across the vine are first quantified in allometric terms; that is, changes in the relative area of leaf subregions expressed in terms of overall leaf area. Shape is constrained to strict linear relationships as a function of size that vary between species. Statistical analysis of leaf shape, using landmarks and EFDs, reveals that species effects (regardless of node) are the strongest, followed by interaction effects between species and heteroblasty (i.e., species-specific patterns in leaf shape across nodes) and that heteroblasty effects across nodes (regardless of species) are negligible. The ability of different nodes to predictively discriminate species and the variability of landmark and EFD traits at each node is then analyzed. Heteroblastic trajectories, the changes in leaf shape between the first and last measured leaves in a vine, are then compared between species in a multivariate space. 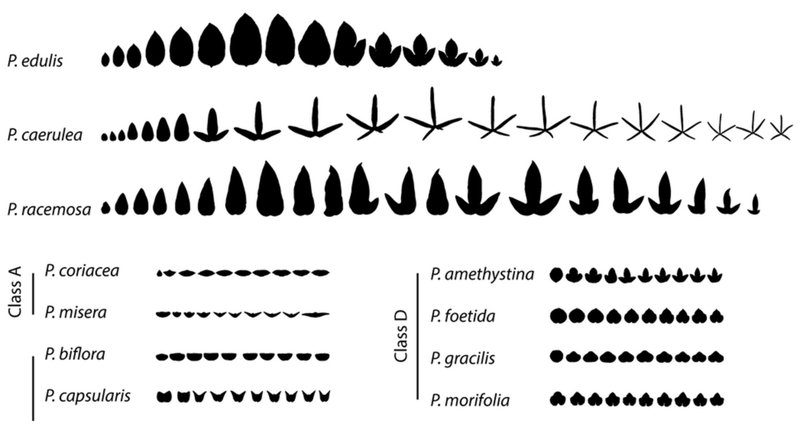 Leaf shape diversity among Passiflora species is expressed in a heteroblastic-dependent manner, unique to each species. Leaf shape is constrained by linear, allometric relationships related to leaf size that vary between species. There is a strong species × heteroblasty interaction effect for leaf shape, suggesting that different leaf shapes between species arise through changes in shape across nodes specific to each species. The first leaves in the series are not only more like each other, but are also less variable across species. From this similar, shared leaf shape, subsequent leaves in the heteroblastic series follow divergent morphological trajectories. The disparate leaf shapes characteristic of Passiflora species arise from a shared, juvenile morphology.